From Monday Marc Fennell’s weekly routine changes when he becomes the host of a Live News show, The Feed, for SBS 2. Fennell (second from left), best known as ‘that’ movie guy, was previously one of the Hungry Beast team on the ABC. Now at 7:30pm from Mondays – Thursdays he will host a 15 minute news show targeting viewers in their 20s and 30s. “It’s a mixture of news of the day with feature stories that have a focus on technology and popular culture,” he said. “So there’s a wrap-up of what’s going on in the world. The stuff that you need to know and then we have graphic features, not vastly dissimilar to the sort of stuff that was quite popular on shows like Hungry Beast and have since been on other programmes. The show will be repeat at 10:30pm, plus be available via YouTube channel, SBS On Demand, Website, Facebook and Twitter. Fennell says SBS did a lot of research on how younger viewers engage with News. “People in their late 20s and early 30s were dipping into channels like ABC News 24 and Newsradio for about 15 minutes. That was as much as they wanted. So the goal with this is to become a show that does that but with an SBS 2 personality. It’s not the sort of thing we’re only expecting people will only watch Live on TV,” he observes. Fennell will be joined by SBS reporters Patrick Abboud, Jeannette Francis and Andy Park and share resources with World News Australia. “Next week we have an amazing story that Patrick Abboud has put together which is about gay Muslim men and gay Muslim women in Sydney who are getting married to each other, literally to keep their families off their back. It’s a story that has a sense of humour and an amazing sense of pathos to it, and it’s the sort of story where SBS is the right broadcaster to tell that kind of story,” he says. But the purpose of the show is aligned with the rebranding of SBS 2 rather than taking on the competition. “The goal of the show for SBS is to get more people to sample SBS 2 and have a daily driver. But my goal is to come up with something that starts a conversation with legitimately good TV that people want to watch. David Knox blogs Eurovision for SBS. I’ve seen a couple of their updates this week as well as the ad tonight. Looks good. The only problem I have with it is the 15 minute concept. Unless they pair it with another 15 minute show that would compliment it or 45 minute show. Because on SBS including ads. The other thing I’d request is can’t SBS move the watermark on the secondary channels (NITV and SBS2) to the right bottom of the screen. Although I really prefer no watermarks. The bottom of the screen is the next best option. I think the transparency is good for a watermark however. Even though I’m no fan of them. So “The Roast” but serious? 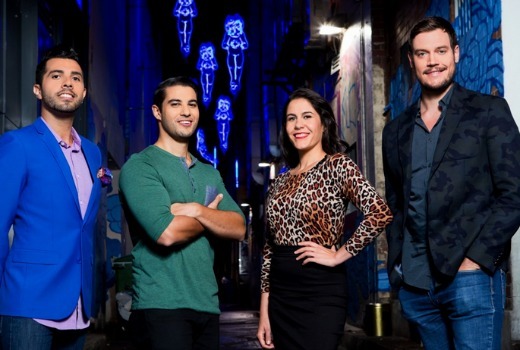 i hope that this show works out for the best for SBS2 – and stay on the schedule for a while. Marc Fennell had good on-air pressence while he was on Ten’s The Circle show , as the ”movie reviewer guy”. Good on him, i say, for hosting The Feed. Marc Fennell’s work is always excellent. I’ll be checking this out… probably via SBS On Demand.